How hard is it to brew a good cup of tea? It's really easy to mess up a cup of green tea. In the case of Dan Cong, commercial grade products. Some can actually taste bad. It's really hard to max the potential of great oolong tea. In the case of Dan Cong, the high end old bush Dan Cong. Without gong fu, it won't taste bad, with some serious Gong Fu, you can maximize its potentials and be rewarded by its beauty. This is a lid of some sort, beautifully hand painted. I am using it as a saucer. Next to that is my flaming gay red hot orange rice bowl cup which I lug around a lot. Everything is old but the orange bowl, I also have a brown one with gold shimmers, a few pink ones, a few soft yellow ones, a couple of dark blue ones. Rice bowl is my favorite shape although not conventional in tea terms. 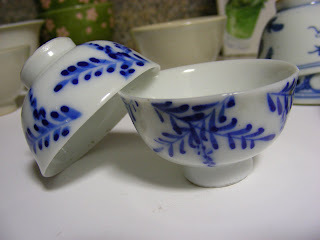 Up side down cup is old as well, I have 4 and each one of them taste different. Yeah, it's insane! Same tea, different cup, different flavors. P suggested this monster experiment to try each cup to see if they taste different. I didn't think I should start a whole new controversy on cups, since there are enough to go about clay pots, but we couldn't help it. Anyways, I refuse to dig further into this. This can turn into a big monster obsession on top of all my other obsessions. I have only 24 hours a day and limited supply of brain cells. Tiny cups, hand made and hand painted, god knows how old they are. White translucent clay, imperfect shapes. My newly acquired cup sets, 6 sets of hand made and hand painted cups with matching saucers. Very nicely made with even thinness. 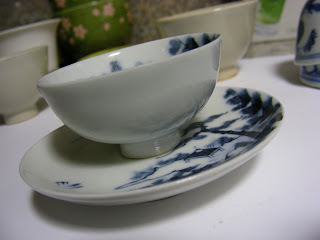 Each cup and saucer are different from another although precisely made with fine details. Old but not sure how old. They are a bit too small tho, it's so small, the tea turns cold really fast, so fast that moving from the table to my lips is not fast enough to have a cup of hot tea. I'll use them for something else. Gift from JM, these are Japanese made cups with crackle clear glaze. The bottom of the cup has a dot of blush pink. Such darlings! 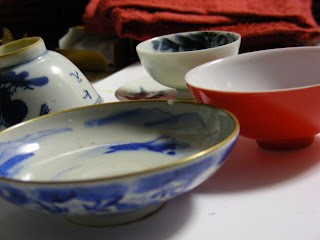 They go well with shu pu-erh in taste, also appealing in looks with amber color matching the light pale earth green. Although I messed up with leaving shu pu in it over night, some tea sipped through the crackles and left minor stain marks. 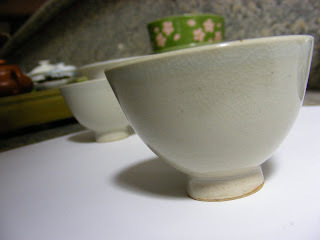 60 hand made white cups (new) will arrive in the next shipment, made in Chao Zhou by hand. A couple drove more than 100 miles from San Diego county all the way to Palos Verdes for some tea. 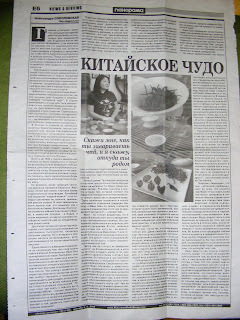 They found out about Tea Habitat through a Russian news paper, not the LA Times. I was stunned to find out the LA Times article was translated and republished in a Russian news paper. 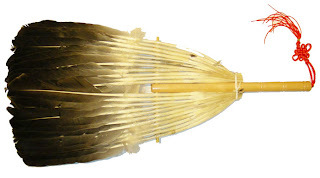 Goose feather fan, one of the 18 essentials of Chao Zhou Gong Fu Cha. It's funny how perception by the norm in my childhood days, things that are ugly and old (out of fashion) last long into my adulthood. I knew this goose fan was one of the essentials of Chao Zhou gong fu cha, but I didn't want to have one because compare to the new wood carved, nice paper/silk fans, not to mention the electric fans, it just looks too neolithic. Reading Chinese classics really open my mind about ancient traditional philosophies, tools, medicines, and much more. I realize if something has lasted for thousands years and still in practice widely today, there must be a significant function of such existence which is better than others including new inventions. The western mentality is newer the better, invent and invent and more new inventions. The eastern mentality is re-invent and refine. Anyways, I told myself, I should get a goose fan because it's still being used today by the cz locals. I also learn to listen, accept ideas from the right sources, although with questions in mind. Sometimes I wonder if I should put aside the questions, practice with the idea to find the outcome before asking questions. Pure skepticism will not get you too far. Learn with an open mind. When the truth unfold, questions will vanish. This is a long over due post, as most of you read my blog knows what had happened and how my time was spent for the last few days. Anyways, back to business as usual, and blog as usual. Tea we used was a commercial special grade of Da Wu Ye - Big Dark Leaf. DWY is one of my favorite tea with a ginger flower aroma when it's made well. The commercial grade is not as great in fragrance, flavor and texture compared to the old bush teas. When comparing to the same class/grade of tea, it's on top of my list. I brewed with 2-3 grams of leaves in each vessel, used the same water, same timing. Wu's Chao Zhou Sandy Red Clay pot: aromatic, richer, smoother but not buttery, sweeter, thicker texture. The initial brew was an open answer tasting. The second brew was closed "book" tasting. I switched the pots order to Gaiwan, Wu's then Zhangs. 2 people liked the Gaiwan, and 1 preferred the Wu's. Both people preferred the gaiwan like it because the flavor is richer, in my opinion, it's more flavorful with everything presented in the cup, the good and the flaws, but not necessary a better cup. The flavors (both good and not so good substance) are more detectable in a gaiwan. The Zhang's muted the tea a little too much, buttery to the point it feels soapy slick, the aroma was missing quite a bit. A Yixing is even more so compare to the Zhang's conducted previous with green tea. I think this is why it makes great green pu-erh, young in particular, since most pu-erh are not as fragrant as DCs, some with sharp dryness. The Wu's is the winner in my opinion. 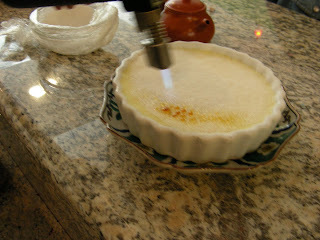 It has the aroma as much as a gaiwan, the texture is refined with rich full texture, sweeter. 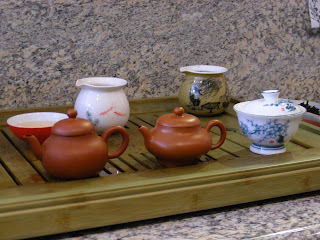 I have been using a couple of Wu's pot to re-taste many of the dc teas, single bushes mostly. I found that it made roasting/toasty flavor disappear. The 07 Po Tou - ginger flower was reroasted and I can taste the roasty flavor in a gaiwan and was not as desirable as I first had it in 2007. When I made it in the Wu's, the aroma came back although not as fresh as flowers after rain (that's how it felt in 2007), it turned into a matured sweet floral aroma, the after taste was amazingly sweet and clean. 2 tea tasters were quite impressed by the sweet after taste. It was actually more sweet and lingering than I had it in 2007. I am glad the Wu's brought Po Tou back to my favorite, at one point, I thought of writing it off my favorite list. Chao Zhou pots are well known, or much more well known than Yixing in Southern China-Guang Dong and Fu Jian oolong drinking regions and many South east Asia countries. It's better suited for most oolongs. But you'd wonder why areas outside of those mentioned use Yixing mostly or unheard of CZ pots? It's because they are not made in large quantity, also not artistically made as the Yixings. This is the reason why the more I know about Chao Zhou culture, tea culture and people culture all together (people culture reflects in tea culture), the more I love the region. It's rich, unassuming, not flashy, but full of substance in literature, culture, rites, food, tea, teawares. All of which are great without the fancy packages, most of which are designed for practicality for best use. The people are not as fashionable as Shanghai or Guang Zhou. Phoenix mountain is not as famous as most well known Chinese mountains such as Tai Shan, Huang Shan, etc. Dan Cong teas are not as well known as Long Jing or Tie Guan Yin. Tea pots are not as well known as Yixings. But over all tea culture known as Chao Zhou Gong Fu Cha is world renown although the components are not, which is quite weird. Chao Zhou tea culture is the richest, deepest and most fancy in technique and equipments, but at the same time, not that many people know of the actually details. Seems like a controversy in itself eh? What does Cong 丛 mean? There are many confusion about Dan Cong - 单丛. It's 单丛, not 单枞. The correct Chinese character has always been 单丛 used in Chao Zhou. Out side of Chao Zhou, it's aslo commonly seen as 单枞. Yes, even the Chinese in China-alot of them too misuses the character. 丛 (Cong2): bush, shrub, a cluster of branches grow from the same root as one single plant. The 2 characters have extremely different meanings with different sound/tone, mismatching doesn't even make sense. It's quite disturbing to see the Chinese misuse the character in China, hence misleading foreigners. You can even hear Chinese national TV hosts say 枞 (Cong1), emphasizing the incorrect pronunciation as correct. This problem perhaps can be corrected when over all education improves in a couple of generations if not longer. Tea farmers are mostly illiterate in China, great tea making skills but lack of eloquence. When China is open to private business again in the last 20 some years, a flood of misused characters can be seen everywhere, logos, signs, fliers, ads, menus, etc. English translations are even more hilarious during the Olympic games. Dan Cong, literal translation is Single Bush, as a bush is a cluster of growth from ground up feeding off from the same root as one plant. 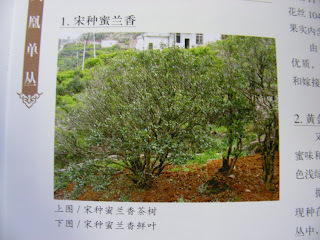 In Chinese, a bush has no limit of height and size, unlike the English term, it's limited to a small short shrub. Hence, a tall tree with many large separate branches attached to the same roots is also call a bush (1 丛) as a unit of tree. Cong is also loosely translated as trunk, grove, and some other meanings. While not entirely wrong, but not quite precise either. Translation and interpretation from one language to another is never 1 = 1. As long as 1 = .9 is rather understandable. If someone claims 1 = -1, that wouldn't be so acceptable, eh? This debate of Dan Cong's meaning had been meaningful up to now. It's no longer a debate because a debate involves reasoning and evidence from both parties. I don't see any evidence or proof, except the reason of I sold tea for 20 years and I have seen non Dan Cong teas made for 20 years. Resources of Chinese tea producers are not even from the Chao Zhou Phoenix Mountain. I feel my continuous effort is like playing music to a buffalo. Some what silly! I have respect for someone in the tea business for so long, it's tough and require love of tea, but if that is the sole reason which makes one believable in EVERYTHING they interpret is CORRECT, again I suggest getting the facts together before accusing others for spreading misinformation while they are the source of misinformation banking on the fact that 20 yrs in the industry automatically makes them believable and INCORRECTLY right but also believable. People will believe what they already believe and whom they choose to believe regardless of the truth which is well documented for many years. They are not truth claimed by me. My function is to present these evidence, but take it or not, it's no longer part of my job. I now know how crucial it is to have translated Chinese tea books, more than I realize previously. Please be patient for the English version of Feng Huang Dan Cong to come out. It will give you the information you need: history, today's practice, cultivation - single or not, processing, tasting method, identifying less than perfect teas and more. It's a very comprehensive book with detailed explanation and pictures. I was gonna let it go, but seems like I have been accused of misleading the tea loving public. Let me show Roy Fong some hard evidence of such phenomenon. This is a book I am translating: Feng Huang Dan Cong. It does not have a gram of my opinion. If any one reads Chinese, please correct me if I were off on the translation. Following is the exact same description of a tree name Song Zhong #2 in Chinese as in the hard copy of this book shown in picture. Below that is my translation word for word. Song Zhong #2 is also called Song Zhong Jai Dan Cong – Little Song Zhong. It’s propagated from a natural hybridized seed of Song Cha Da Ciao Peng Dan Cong - Big Thatched Shed, hence the name Little Song Zhong. Song Cha Da Ciao Peng died in 1928. Located at 116°38′38″ longitude, 23°58′19″ latitude on a hillside facing northeast, 950 meters above sea level, in a tea garden behind Feng Huang Da An village. It was property of Feng Huang Tai Ping Temple from 1660-1952. 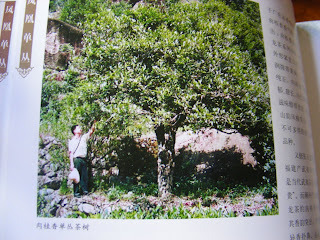 During the Land Reform Movement in 1952, this tree was assigned to Mr. Huang Yong. It was then owned by Da An production team from 1958-1980. It’s under the care of Mr. Huang Nian Qing in 1980-1997, Mr. Huang Ai Guo from 1998-2000, Mr. Huang Bao Guo since 2001. This tree is propagated sexually, age 347 years old, 5.56 meters tall, spread out tree body, tree crown is 5.6X6.5 meters, main trunk is not visible after additional soil, 6 split branches at ground, medium branch density. Leaves grow slanted upward, long oval shape, 7.8 centimeters in length, 3.7 centimeters in width, smooth surface, flat leaf body, shiny dark green, medium thickness, 9 sets leaf vein, round pointy leaf tip, slightly wavy leaf rim, 24 pairs small, shallow and blunt saw teeth. Sprout growth is strong, spring sprouting begins around Spring Equinox, picking begins 15 days later, dense new growth of light green color with small amount of white down. New growth is up to 12 centimeters long, 3 to 4 leaves on each stem separated by 3 centimeter. 2 new growths each year, stops growing at the beginning of October. Blooming season is in mid November, 3.2-3.8 centimeters in flower diameter, 120-130 stamens, 3 heads stigma, 2 seeds in each pod. It produced 6.6 kilograms of tea in 2007, sold for 12000 RMB per kilograms. Produced 5.6 kilograms of tea in 2008, sold for 13000 RMB per kilograms. I am not trying to be righteous. But this is getting out of hand and too many people are getting involved, some are even from over seas. The authenticity of Dan Cong, reputation of Chao Zhou people and mine are on the line, I am going to bust out a direct source of the Feng Huang Dan Cong book for Roy Fong to contact, Mr. Yao Guo Kun. Mr. Yao Guo Kun is currently the head of Chinese International Tea Culture Research Institute - Academic Department, also vice head of Zhe Jian Forestry Institute - Tea Culture Department. I don't understand why is it so hard for Roy to believe such practice exist in the old days and today. This book is published this year, written by some one has 25 years of Dan Cong growing and producing experience, plus a masters degree in Tea Biology currently teaching at a University on subject of tea cultivation. If that does not make his THEORY (as Roy calls it) practical and REAL, I have nothing else to say. Let me clear it again, we are talking about small individual tree production, not mass quantity production as in a run of the mill tea farm. What is enough for what quantity production must be clarified. I am not saying a tree will produce enough for the mass population with thousands kilos of tea, a few pounds is a very reasonable and producible amount from one tree. This is not considered as commercial production, it's ALTRA RARE (borrowed term from ITC) also sold in markets. This is not even a secret! Why is it so hard for a man to admit he's wrong! Please do not disqualify others with less than 20 years of tea business experience to take on this debate. Discrediting documentations all together is not a way to update tea knowledge in my opinion, combined with taking for granted of one's long term working experience. It's sad to find such mentality in any industry. Theory alone is not enough, experience without theory can only take you so far as well. From Roy's contacts' response, China is as misinformed or not informed as people in the US. It's understandable that one region's tea producers do not know about another region's tea. Asking a Yunnan Pu-erh producer about Dan Cong is like asking a Mexican to cook French cuisine, isn't it? The most reliable source of correct information is from the people grow those trees and make them into tea with their own bare hands. I am willing to take anyone who's interested in witnessing tea produced from a single tree to Chao Zhou next Spring, Roy is more than welcome! JM is eclectic and well versed in many subjects we share interests in. A generous soul that he is gave me a Chinese medicine book from his own library collection, Japanese ceramic cups and plates as gifts. I can't thank him enough! 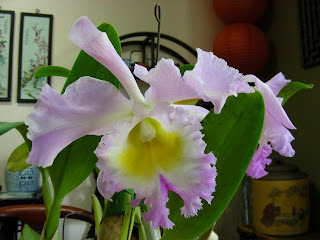 LA Times mentioned my orchid obsession, that brought many orchid growers into my store. G gave me a couple of orchid plants from his mother's orchid collections whom has been growing orchids for more than 30 years. I am not an expert in orchid growing. I am one of those who buys a a plant because of its beauty and not already in my collection. You can call me the possessive kind without much knowledge in depth (because most of my time are devoted to tea). 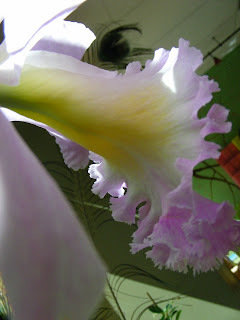 The flowers are so large stretching 6 to 7 inches across, beautiful fragrance that illuminated my whole store. I love coming in the morning when the fragrance filled the entire room in concentration. Thank you all for fueling my many obsessions! I can say thank you a thousand times. I am just very grateful! I found this article online and dumbfounded! Especially coming from a reputable tea shop. Let's get to the point here. Quote: Actually, while dan cong (单丛) literally means "single bush," it doesn't refer to how the tea was picked. It's a botanical term relating to the morphology of the tea bush. While most tea bushes emerge from the ground in a cluster of branches, the uncommon dan cong variety emerges as a single trunk that branches off higher up the stem. 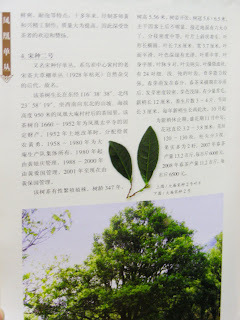 From what I am reading here, the writer said Dan Cong is a single trunk tree that branches off higher up the stem, therefore Dan Cong is named as Single (trunk) tree/bush which has nothing to do with how it's processed. But most of the tea bushes (excluding DC) emerge from the ground in a cluster of branches, therefore not called single (trunk) tree/bush. Translation: Phoenix Dan Cong is catagorized as Oolong tea, development began in Ming Dynasty, produced in Chao An County, Phoenix Town, Wu Dong Mountain, gained its name Dan Cong (single bush) based on harvested and processed single bush/tree/plant indivdually. Zhi Lan Xiang - local name is Ji Long Han - Chicken Cage, 7 branches from the ground up (click on picture for larger image). 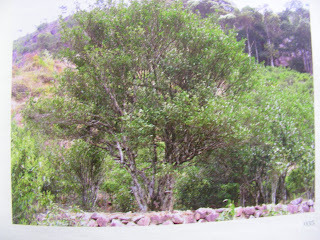 4.87 meters tall, tree crown is 5x2.1 meters, produced 4.65 kilo of tea (finished product) in 2007 Spring, 5.5 kilos in 2008. Mi Lan Xiang - Honey orchid, 8 branches from ground up. Rou Gui Xiang - Cinnamon Aroma, 1 main trunk, 2 split branches at 0.56 meters above ground, annual production is 5 kilos tea (finished product). In fact, majority of the Dan Cong tea trees/bushes are branched off from the ground up, rarely a single trunk as the Rou Gui Xiang tree in above picture. Quote: Unfortunately, tea sellers who have never visited tea farms and don't know tea all the way from the farm to the cup have misinterpreted the literal meaning of the Chinese characters and spread misinformation about dan cong tea. These inaccuracies have quickly propagated via the internet. If you've ever been to a tea farm or seen tea bushes out in the wild, you know that with a typical ratio of 8-10 kilos of fresh tea leaves required to make a kilo of tea, there's no way a single bush could generate a marketable quantity of tea, even if you killed it by stripping off virtually every leaf! Let's say the writer has visited the farms in Phoenix Mountain. Does that mean commercial products are all there is to this tea region? If so the writer had visited region and had not seen the old bushes and tasted the teas processed single tree at a time, mostly grown amongst homes and not in a FARM, that just means he hadn't seem much of the hills. If this is all the writer learn about this tea at the mountain of Phoenix, he is the one should spend more time learning the truth before spreading inaccuracies which might quickly propagate via the internet. A tree at height of 5.8 meters, covering 6.5x6.8 meters area produces barely 9 kilos of tea does require 35 kilos of fresh leaves. My suggestion is for the writer to find a tree (any tree) of similar size as mentioned, strip the damn tree naked and see how many kilos of fresh leaves (dried leaves on the ground does not count) can be collected. I am so darn curious to find out the out come. Speaking of Dan Cong oolong only here: average production per single tree is 1.5 kilos, with the ratio of 35 to 9, each tree produces 6 kilos of collectible fresh leaves suitable for tea making per year, excluding older leaves. Growing up in the midwest, I had done some yard work of raking fallen leaves. I guess that will never happen to someone lives in San Francisco. Let me tell you, even fallen dried leaves of a tree in size of the above mentioned tree, that's a hell lot of work and bags of them each fall. Marketable quantity is what? Mass production is what's available on the market, accessible to the mass population. Small 1 lb quantity is not mass production that's available in a niche market (at one store only). If large quantity is your game, that also speaks the quality of the business run by such mentality and that's find with me. The mass population have no problem with it, nor do I.
I hope the lesson we learn here, including myself, when we post something online, we are responsible for what we say, not just the self believing "truth" when it comes to the principles of facts. Especially when someone out there believe what you say. It's funny to tell a joke or stretch the truth. However when it comes to claiming the authority of the truth, please be well informed with proof then say so. Selling tea for many years makes one a businessman with some knowledge, brewing knowledge at best, definitely not the authority in production and cultivation! Learning the back ground and history of a tea is fairly important, get that straight before "My words are golden because I said so".